"Health is wealth." This is what Papa would always remind us whenever we're down with a cough or cold when we were younger. It's his way of telling us that we have to do everything to stay healthy all. the. time. As it is his birthday today, I am reminded again of his famous line most especially now that there's an ongoing Zika virus outbreak here in the Lion City. Not only that, we've recently experienced the haze again last week and this got a lot of my colleagues coughing and sick for days. I really dislike seeing the doctor and drinking medicine so taking Papa's advice, I'm researching on ways to prevent these viruses through the best way I know how -- eating. Have you heard of Superfoods? These are not the kind that superheroes eat but well, you might feel like one after consuming it. Hehe! Anyway, these are food items that's loaded with nutrients such as anti-oxidants, immune-boosting particles and more. Last year, Kale took the foodie world by storm wherein people started munching on Kale Chips and adding kale into their bowls of salad and hot dishes whenever possible. Did you know that Kale is not the only Superfood available? There's acai berry, seaweeds, mangosteen, chia seeds, black garlic, cocoa powder and kefir to name a few. The first 3 are so easy to find and they're not very expensive too. 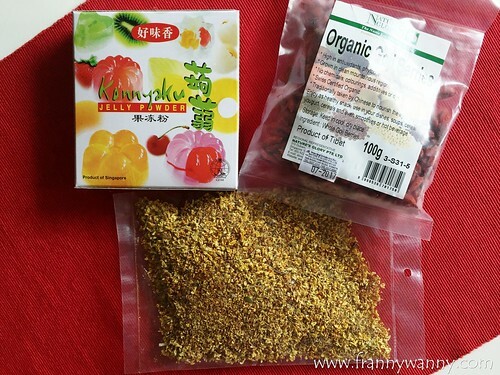 To add to this list, Goji Berry is also one of the superfoods and I was so happy to receive a pack of Organic Goji Berries from Nature's Glory Singapore. I've been researching on what I can do to my pack of goji berries as I normally would just add them into my steamboat soup and enjoy this for days. 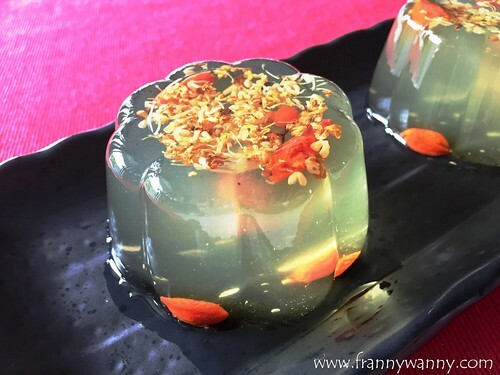 However, I was feeling extra creative then I remembered one of my favourite Hong Kong-style desserts which is the very refreshing Osmanthus Jelly with Goji / Wolf Berries. I did a quick read up on this and was so surprised that it's actually very easy to make. 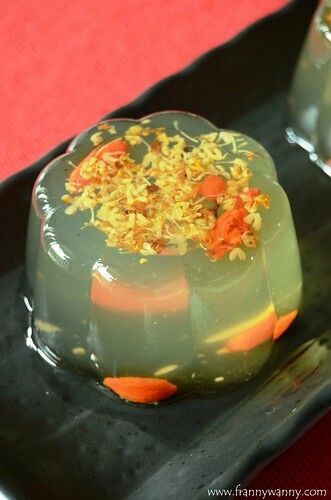 Sharing with you all the recipe and hope you'll enjoy this very nutritious and refreshing dessert too! 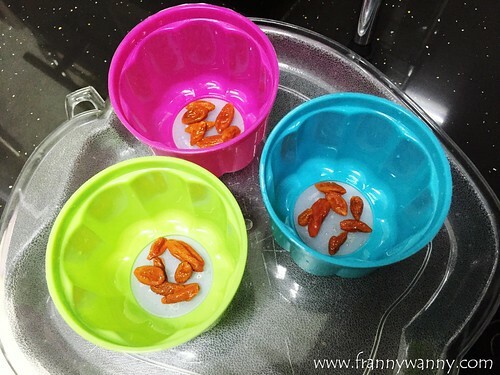 1) Soak the goji berries in hot water for 3 minutes or until they've puffed up. 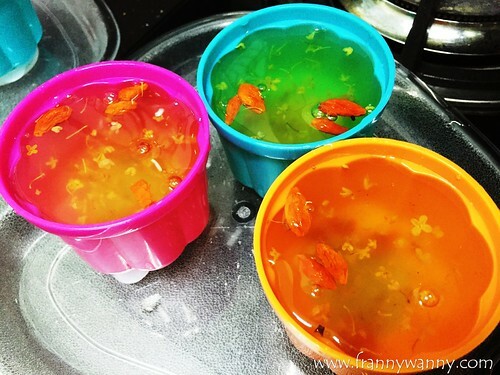 3) Stir in the Konyaku Jelly Powder. 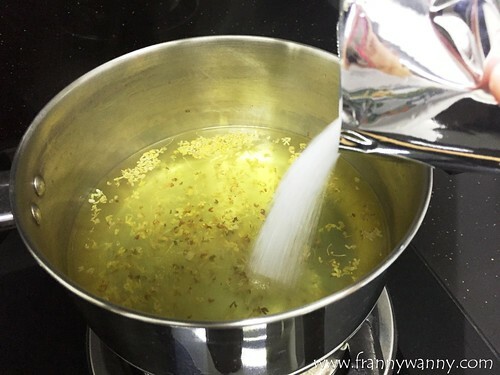 Keep on stirring until the consistency thickens and the mixture becomes slightly cloudy. Remove from heat. 4) Add in the goji berries into your jelly moulds then carefully pour in the mixture until you've reach your desired amount per mould. 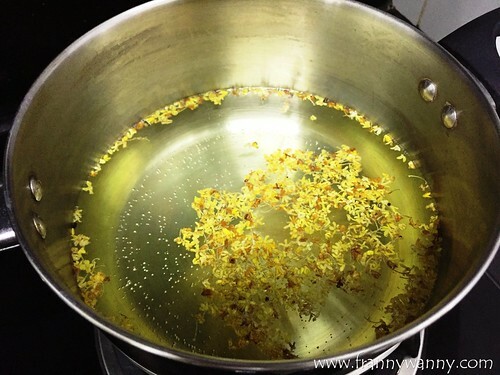 5) Let it set and cool in room temperature. After which, just refrigerate your jellies overnight. Personally, I find that the jelly is best enjoyed when it's cold so be sure to keep it refrigerated up until it's time to serve it. Watch out for my blog post tomorrow on my visit to the Nature Glory shop and what are the items I found there!